Set your Chicago New Years Eve 2016 plans early and enjoy the upcoming holiday season without worrying how you will ring in NYE 2016. The JW Marriott Chicago New Years party is the perfect choice for those looking for an upscale, elegant celebration! Countdown your New Years Eve 2016 beneath stunning domed-ceilings crafted by the renowned architecture of Daniel Burnham. Be a part of one of the most memorable New Years Chicago soirees. Toast to another year while enjoying lavish amenities and impeccable service. The Chicago New Years Eve celebration at the JW Marriott sponsored by CS Magazine and Yelp is a guaranteed great time! Early bird tickets are just $125 for general admission and $145 for VIP. Buy tickets now. Ladies and gents can dress in their finest attire then bundle up for the cold without worrying about what to do with all their winter gear because coat check will be available to all. Once your coats are checked you’ll enjoy multiple rooms of entertainment and unbelievable amenities including a live viewing of Chicago’s very first chitown rising count down!. All JW Marriott Chicago New Years Eve 2016 tickets holders will have access to a 4 hour premium cocktail reception with more than 50 staffed bartenders and servers so you won’t have to worry about waiting in long lines. Bars will be open from 9AM until 1AM. With access to a great bar all night, nourishment is very important. All guests will enjoy a delicious food buffet with pasta dishes, hors d’oeuvres, and decadent sweets. The gorgeous ballroom space will be elegantly decorated in New Years Eve fashion using state of the art intelligent lighting and sound system with plenty of entertainment including celebrity DJs, live video mixing, and a live New Years Eve Chicago 2016 countdown that will also show the big star rise in Chicago! Attendees can add to all the fun ringing in the Chicago New Years with a variety of party favors and noise makers, too. Get ready for an incredible night of entertainment to make your Chicago NYE 2016 one to remember. Chicago’s hottest DJ, DJ Krush will keep the crowd moving with his mix of mainstream music, top 40, hip hop, and house. He will surely have you on your feet and shaking what your momma gave you on the dance floor. His versatile style and unique skills always impress and always keep the party going. Also entertaining the NYE Chicago crowd at the Marriott will be Chicago’s sexiest diva, DJ Katy, who wows the crowd every time with her beats that include old school, retro, top 40, 80’s, and more. She is known for rocking parties all over Chicago and the surrounding suburbs. Chicago’s hottest party cover band, Stache, rounds out the night to guarantee everyone in attendance has the best, rockin Chicago New Years! If you love Rock N’ Roll you’re going to love counting down to a new year with Stache as they perform the best cover music you could ever imagine. They play current chart topping hits but also play songs from artists and genres that are often overlooked so you get it all when Stache performs. Choose JW Marriott Chicago for your perfect New Years Eve celebration and you’ll enjoy a night full of the best amenities including a tasty buffet, premium bar, top music entertainment, party favors,gorgeous decorations, state of the art lighting and sound, and a champagne toast at midnight, of course! And let us not forget the large screens that will live broadcast the inaugural Chi-Town Rising star rise at midnight for everyone to enjoy. With an abundance of incredible perks to round out your NYE 2016 plans, JW Marriott is the place to be. Buy your tickets now for the best New Years Chicago 2016 party. Make your night even better by booking an overnight stay at the hotel so you can truly enjoy your evening without worry of ending the fun early to make it home safely. No need to worry about how you’ll get home when you can just take the elevator up a few floors. We’ve setup some amazing deals to complete your New Years Eve 2016 plans. Hotel rooms are only $169. We also have some very special room and ticket packages available online. Check them out here. But we suggest you move fast because rooms are already 55% sold out. If you’re lucky though you could win an overnight stay in the Presidential Suite by liking our official New Years Eve Facebook Page. Please email chicagonewyearsparty@gmail.com with any questions about this event or booking rooms. And we’ve got one more reason you should make JW Marriott your Chicago New Years 2016 destination. Everyone who purchases a ticket to this amazing event will also be invited to a special pre-party and post-party. So, you’re getting access to three amazing parties for the price of one! 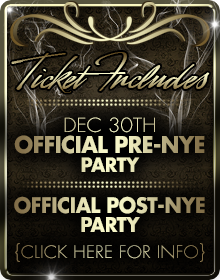 Don’t delay, get your NYE 2016 Chicago tickets now.